Another one of those early starts. Not for work though, for a track day! 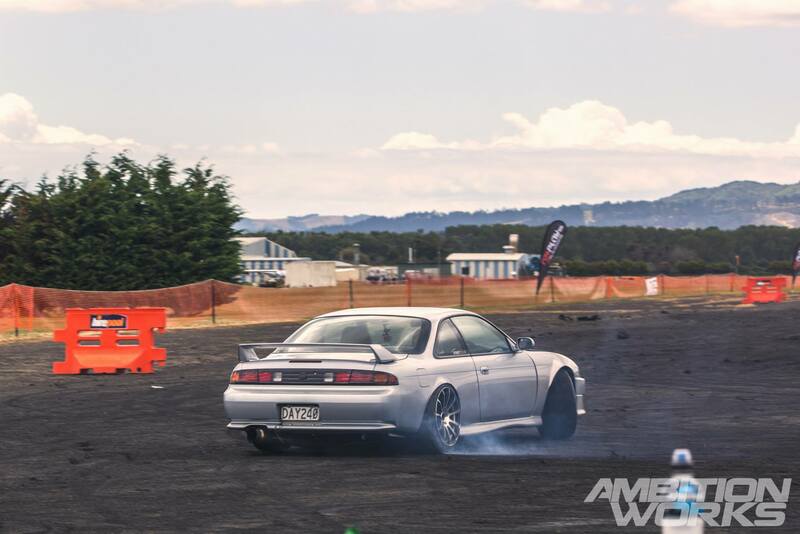 Our man Chris sorted a few of the S-Chassis Auckland members some tickets to the Ardmore Showdown: Wings vs Wheels. It was a day full of drifting and drag racing. It’s always a bit of a struggle getting up at 6am to attend car events when you get up at 6am in the week days and just want to sleep in. 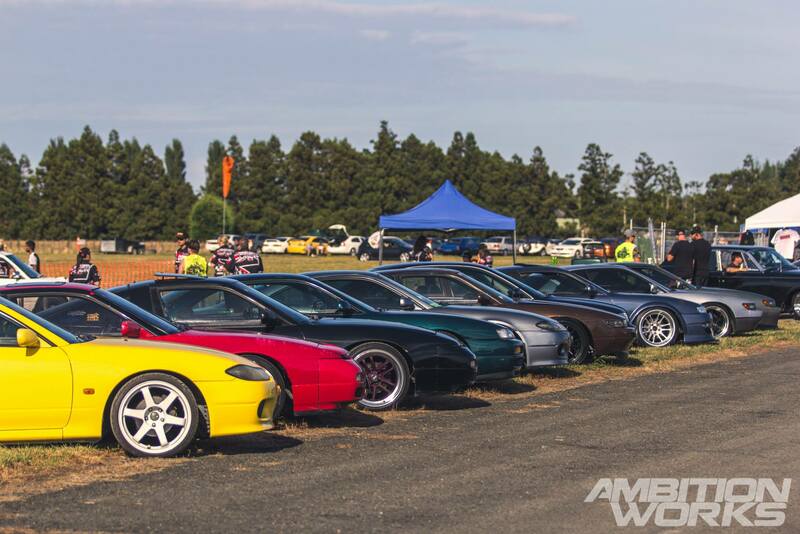 We cruised down to Ardmore Airport with an S13 and three S14s. 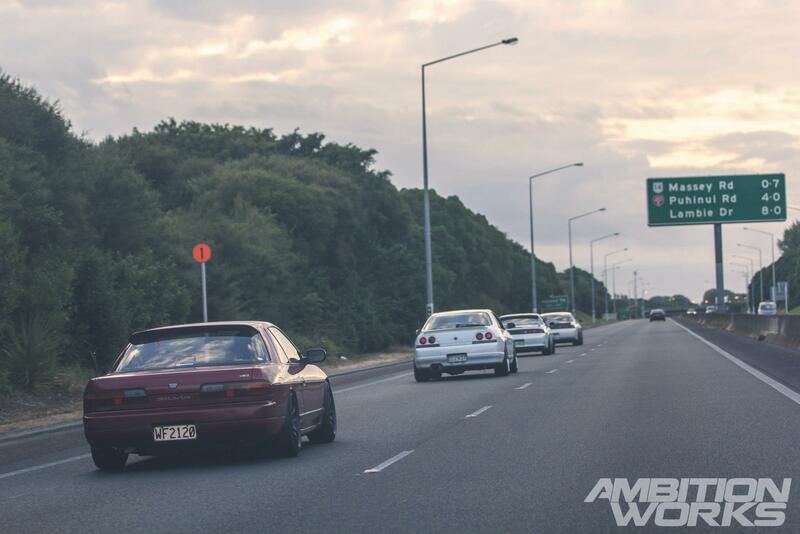 This R33 just happened to join our little cruise session along the way. 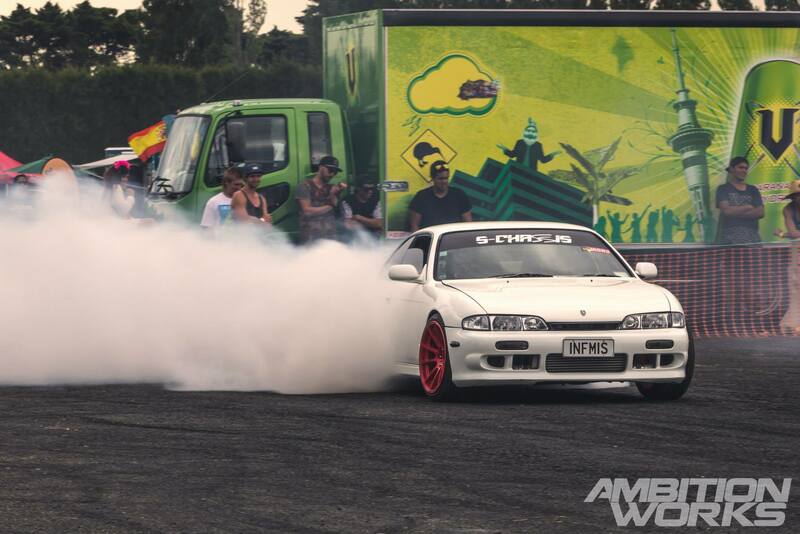 This was not just a drift and drag event. It also held an outside judged show and shine section for cars that didn’t want to drive on the day. 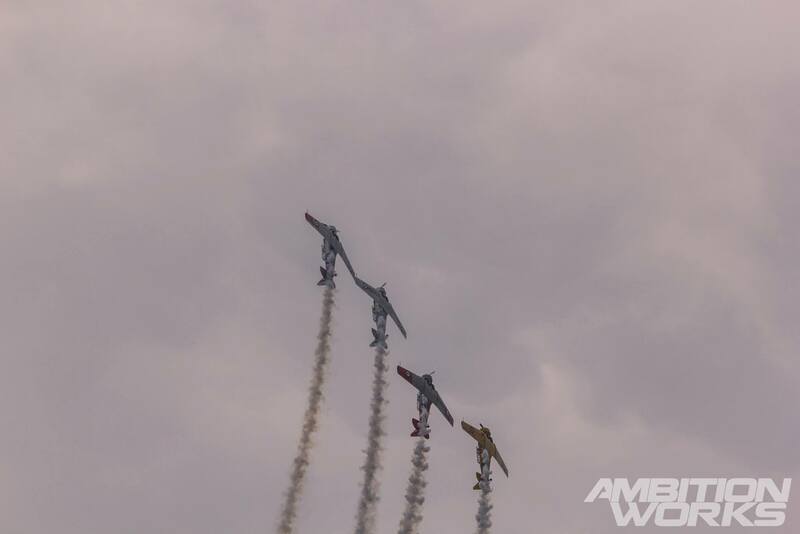 The main event of the day was the wings vs wheels where the jet car took on a jet plane in a quarter mile drag race. 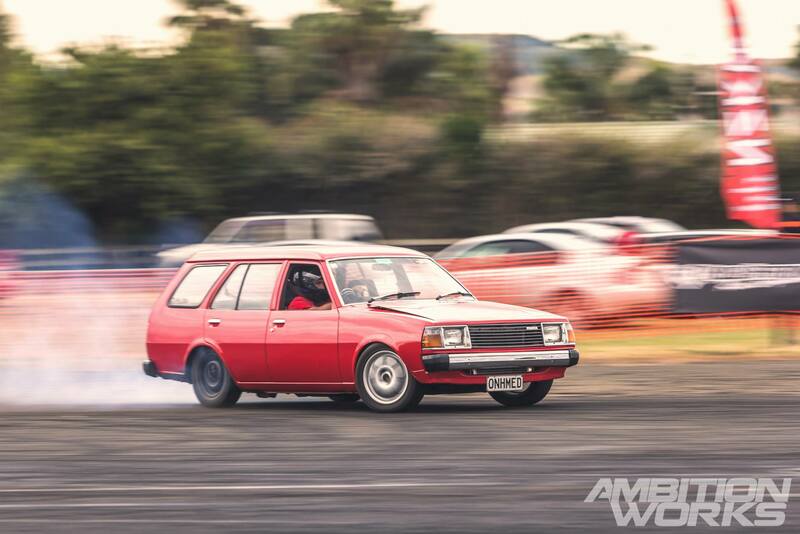 A few other S-Chassis cars made it from other parts of Auckland to join in on the show and shine, and drag racing. This lot of cars always makes people look twice. There are a few absolutely show stoppers in this group, especially Angela’s recently unveiled S14. 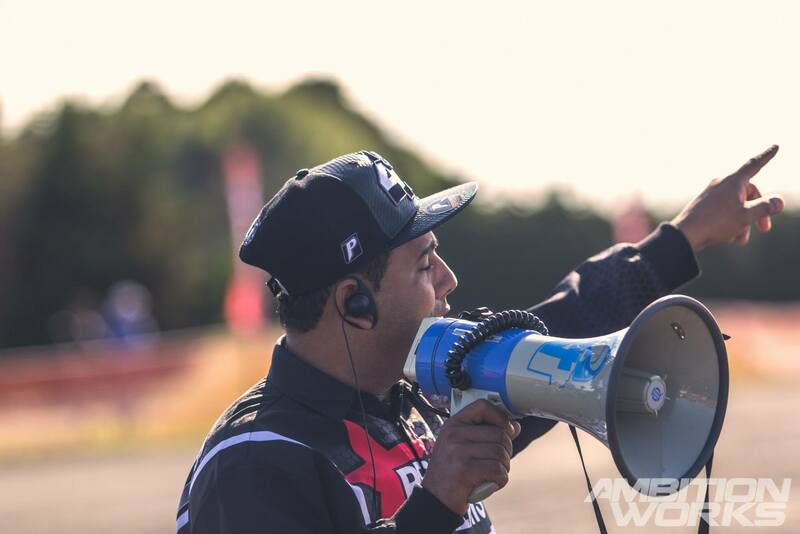 Azhar and his team are the masterminds behind this rad event. 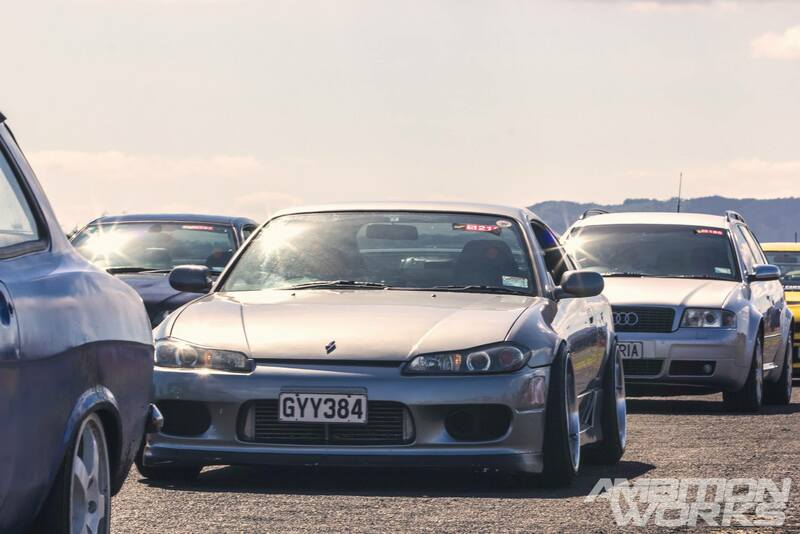 The Ardmore Showdown has only been running for a few years, but the team at Premier Events have over 8 years of experience organising and running automotive events just like this one. This was not a competition day, so all drag racing was done drop flag style. It was pure fun to see who was a better driver on the day. It was nearly time to get out on the strip and the weather was holding up for us, it was going to be a stunner of a day unlike last years event. 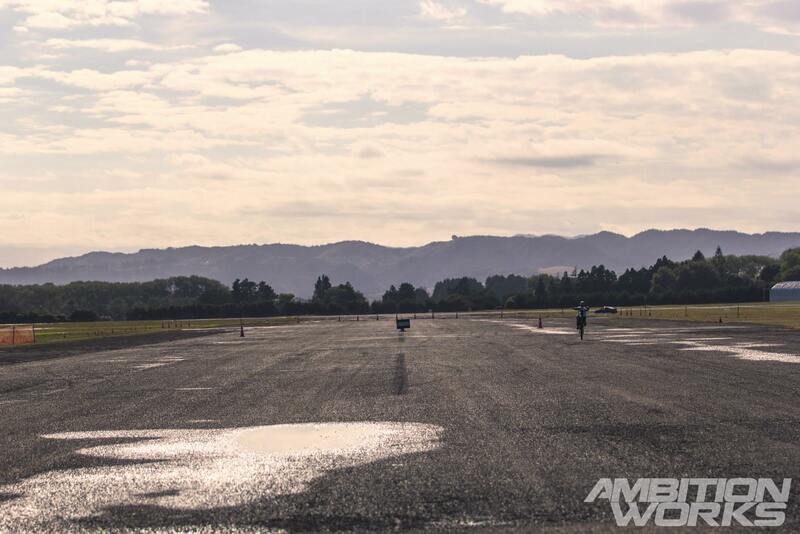 I was warned that the type of tarmac used on the airport runway was very unforgiving on tyres, even the front ones would be worn through by the end of the day. 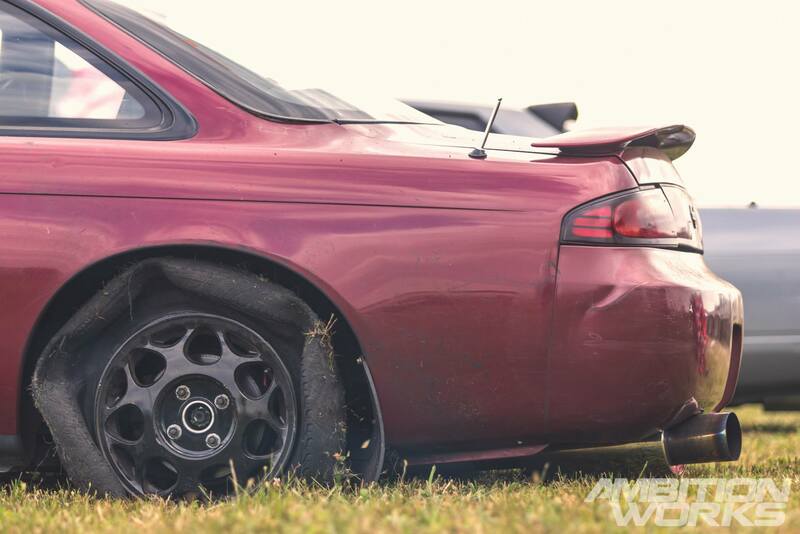 Some people decided just to swap the rears out and some swapped all four for their skid rims or drag wheels. Finally getting to see this car in action was one of the highlights of the day for me. It is used as GT Refinishers run about car but has been converted to rear wheel drive and is equipped with an SR20DET from an S-Chassis. 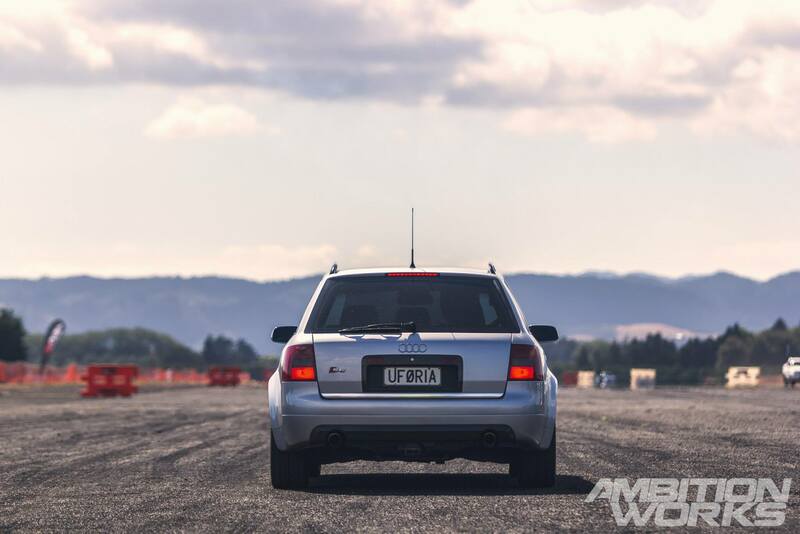 One little fact for foreigners looking on to the New Zealand car scene is that we get two types of this S-Chassis. 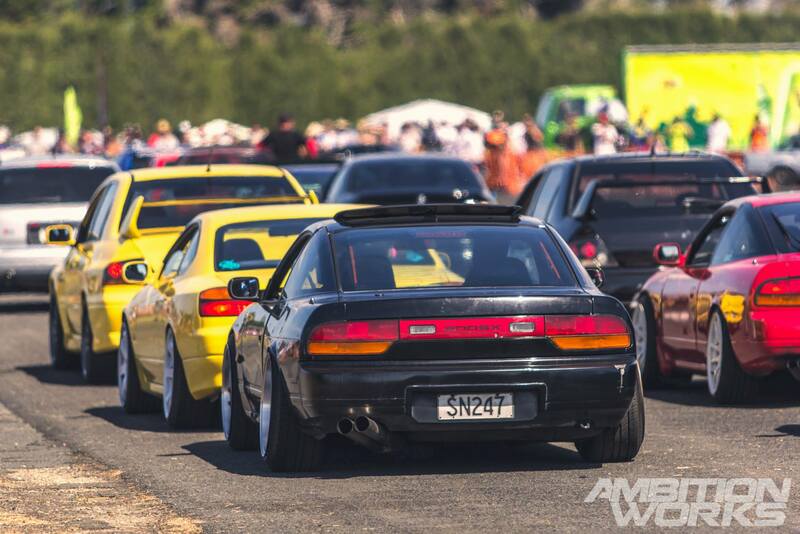 The 180SX and the 200SX. The 180SX and 200SX were mostly identical engine wise until the 180SX received the newer SR engine rather than the latter CA engine. 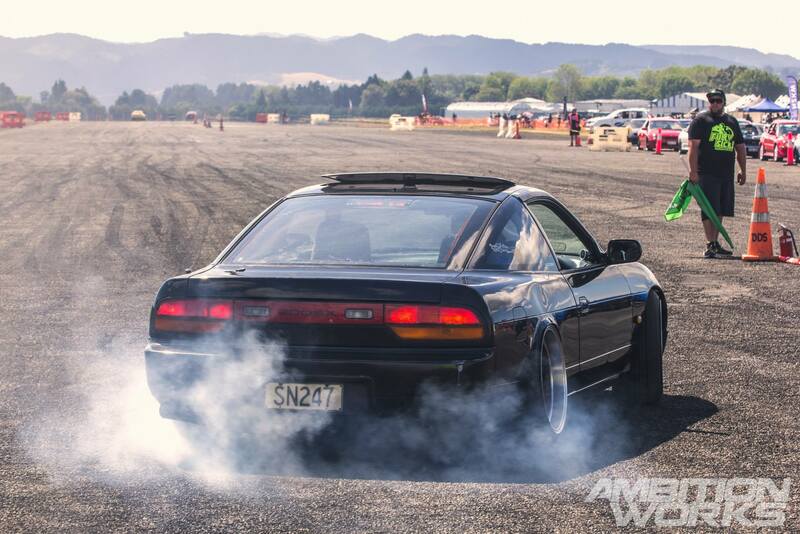 And the fact that the 200SX is our NZ new model and the 180SX is an import only car. 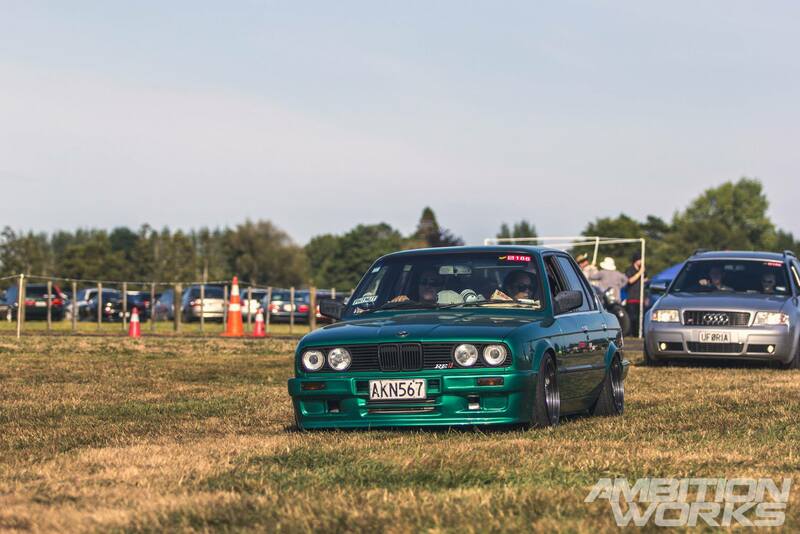 Along with daily drivers there were a few top tier NZ drifters among the mix. Including Nico in his Tanefa S15 and Sky in his 350Z. 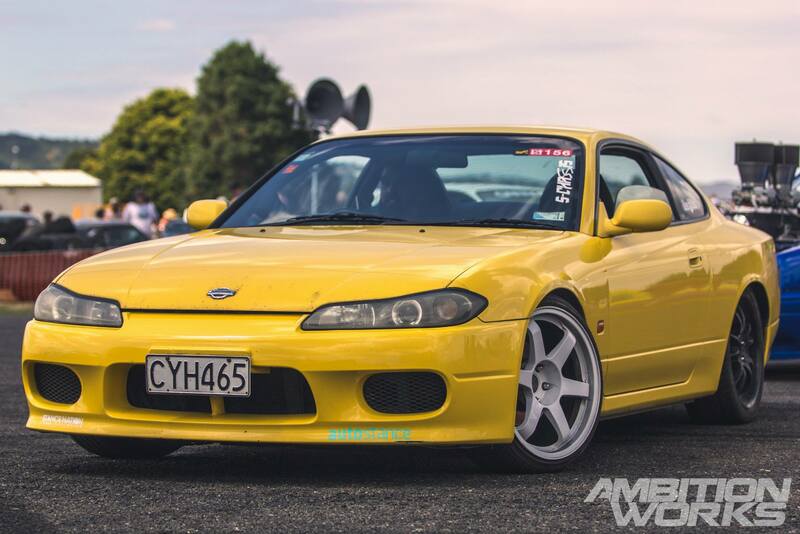 The S15 has to be one of the cleanest looking S-Chassis available especially from stock. This example is sporting a nice set of wheels that sit the body just right, not too high and not too low. I think UFORIA the Audi wagon had to be the one car that caught most people off guard. 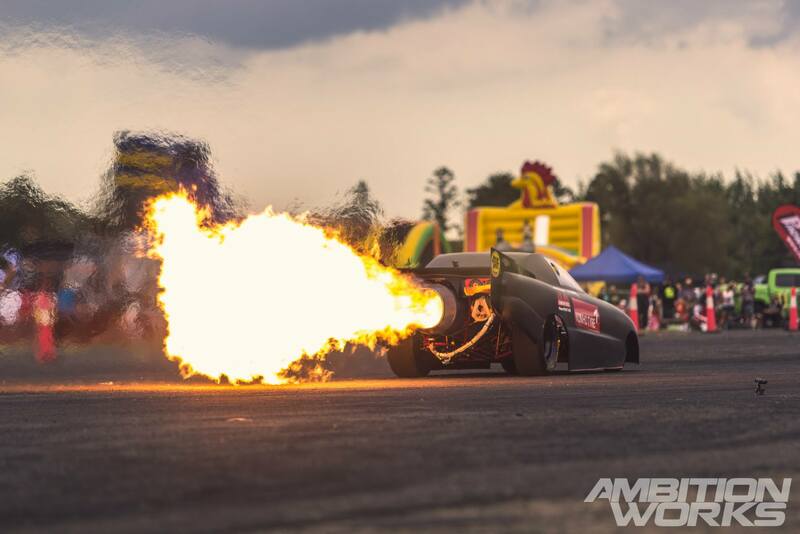 It literally sounded like a Jet plane going down the drag strip leaving most S-Chassis for dust. The time on the track was split up into two groups. Drifting and Drag racing. With Drag racing taking up most of the time on the day due to the number of cars that could go through. 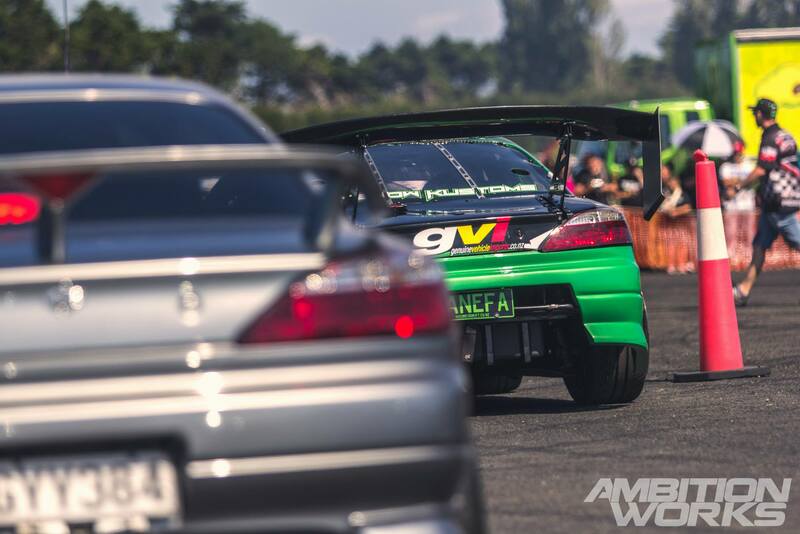 Along with photographing this event, I was also drag racing and drifting in my non turbo Silvia. So it was a busy day for me running around getting in and out of the car. 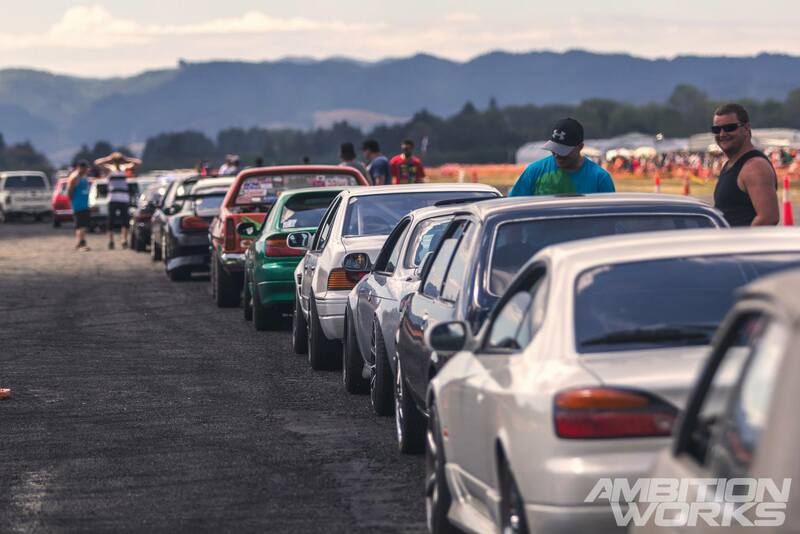 Sitting behind the cars before they took off on the quarter mile drag was one of the coolest spots to camp for a bit. It’s like waiting for a beast to devour its prey. 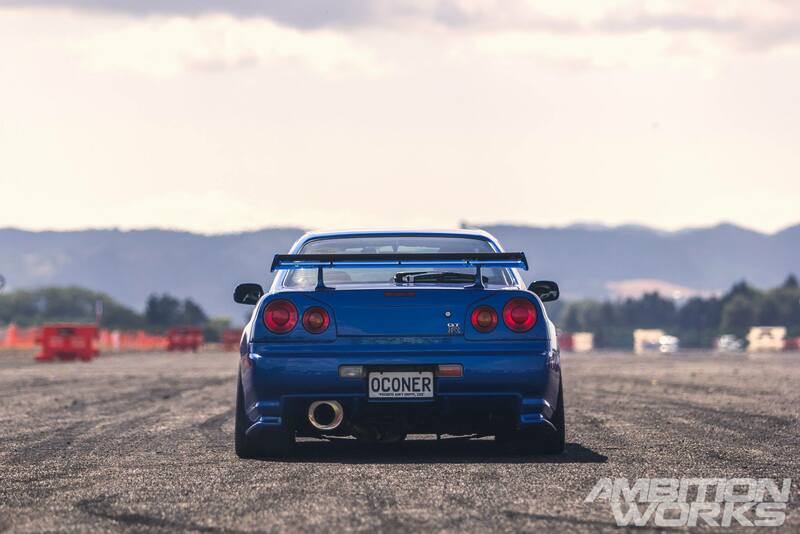 This R34 GTR is rather well known around Auckland almost everybody with their foot in the japanese car scene would be able to match the number plate to the car. 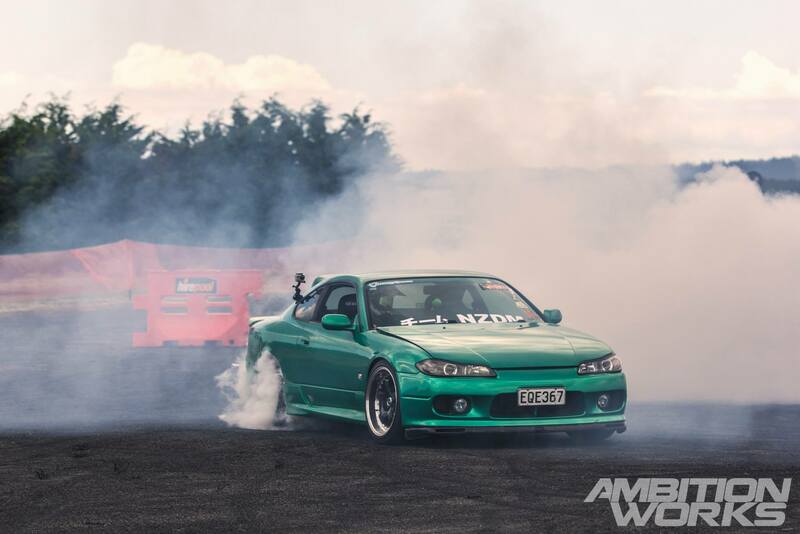 I think some of the drivers that attended mainly for drifting had a bit too much fun warming up their tyres with a few donuts and smoke clouds. 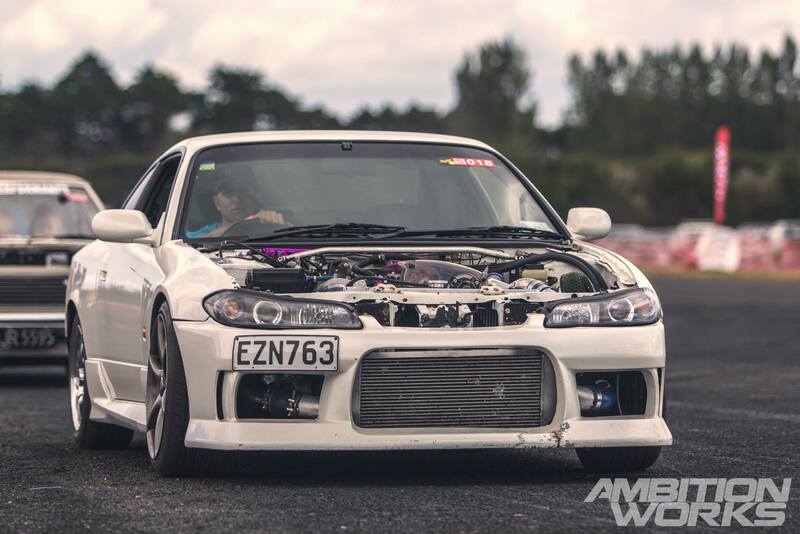 Check out our website for the recent feature we did on Carey’s clean S14 drift car! The first drift session was about to start and I was super excited due to me not being able to get from 2nd into 3rd during the drag racing. 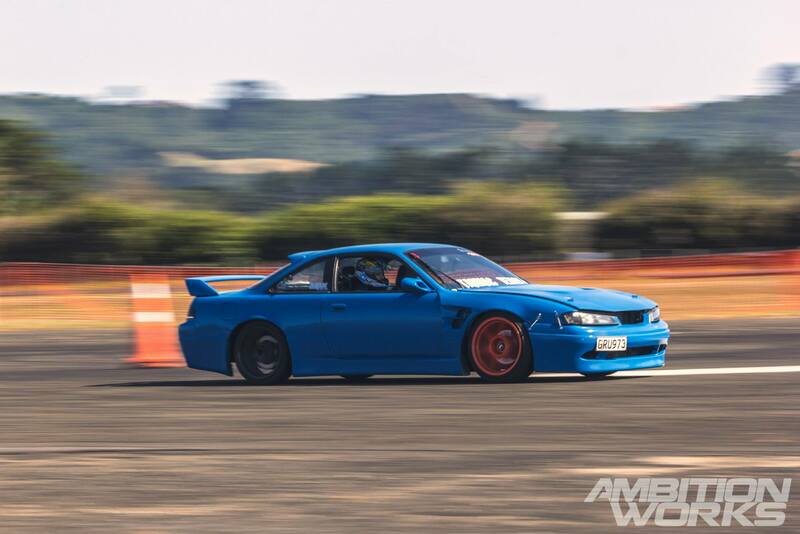 When you have a non turbo Silvia it’s all about the first two gears when you can’t pick up much speed! This however was taking longer than expected, with every driver getting 2 minutes on the drift area a long line appeared. You were lucky if you got two turns before the grid changed back to drag racing. Those two minutes though were mega fun! The rough tarmac meant that I could easily achieve second gear and finally make some smoke pour out of my garbage skid tyres. 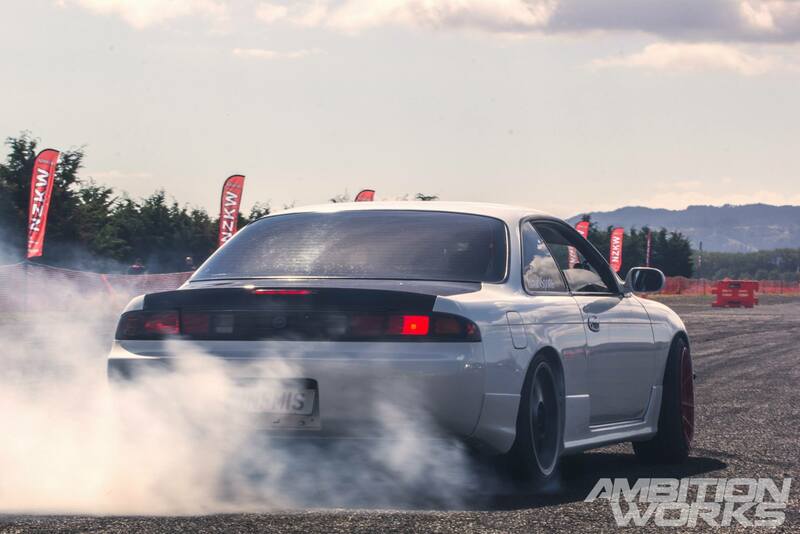 Ben’s Nissan V8 Powered Silvia definitely created some smoke clouds. Watching this car start off in the previous owners hands then get done up only to be sold off and done up even more has been a pleasure so far. I wonder what Ben has planned next for it? With a bonnet present on this white Silvia you would think it was just another turboed S-Chassis. Without a bonnet we can clearly see that this is not that case! Rocking an RB26 set-up this thing left some serious rubber on the ground. There was a lot of cat and mouse during the Drifting side of the event. Having to move my car up in the slow moving line and then run to the front to take photos of the drifters was exhausting to say the least. On the air strip over, there was another event, dedicated to aircrafts. Those pilots definitely had bigger balls than me to do some of the stuff the did! Flying upside down, following another plane, landing, and taking off would require some serious skill and ball size. 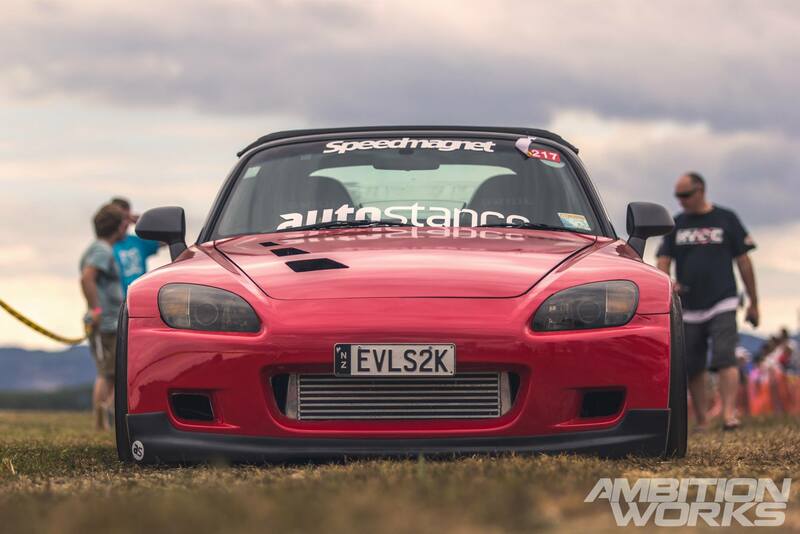 If you don’t recognise this S2000, you will start to. By far one of the coolest street driven S2000s in the country. 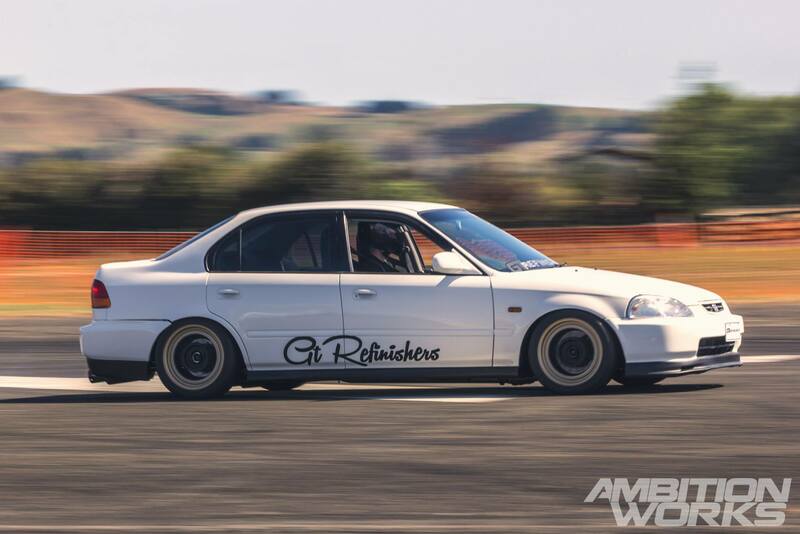 The boys at Auto Stance really know how to slam a car and still drive it like there was a gap between the chassis and the road. Around 2pm the rocket car came out to demonstrate just how powerful a rocket is. This is not a toy. The heat alone would make anyone shiver with excitement. 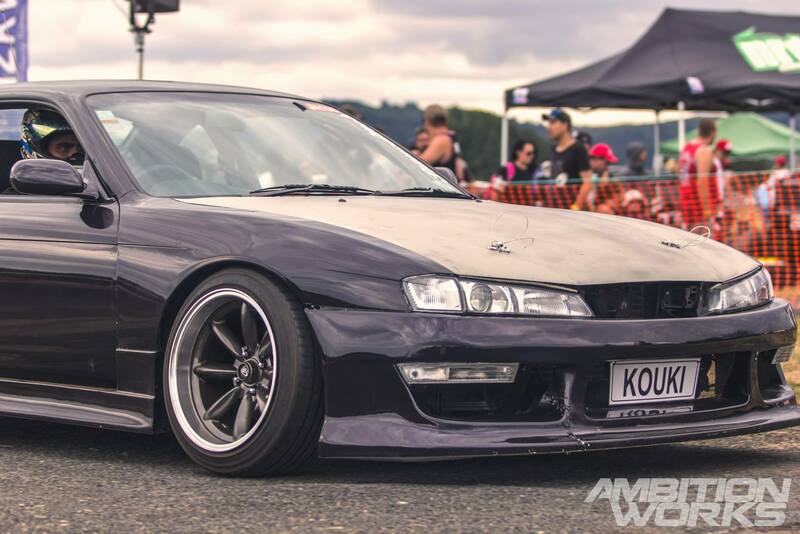 This is another example of one of the super tidy S14s we have around Auckland. 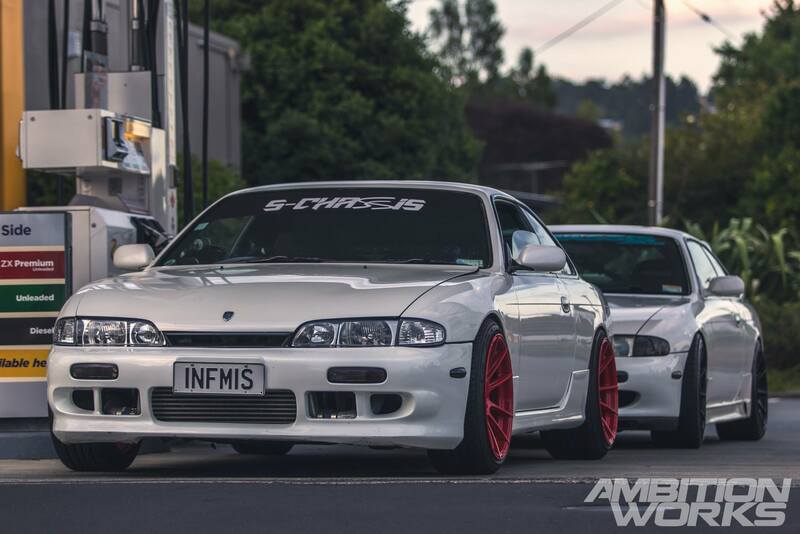 I personally love the aggressiveness that the Kouki version of the S14 puts out. The last sessions of drag racing was just starting and with only one pair of tyres left I saved them for the last drifting session. Although Carey drove this down and needed to drive it home it didn’t stop him trashing it all day. It’s a love hate kind of relationship. When it breaks you hate them, but when nothing breaks you love them to bits! 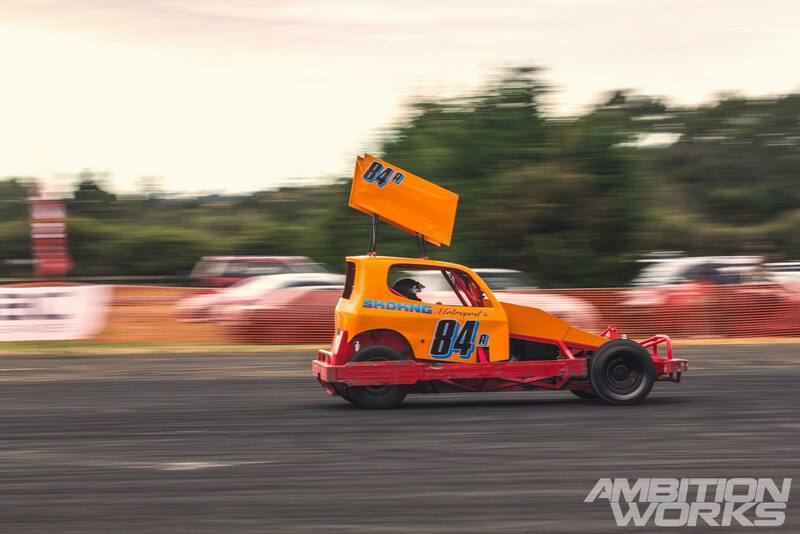 Along side this stock car running down the air strip a few times there was also a trio of go karts that had their go at the quarter mile run. I think towards the end some people were just so eager to start drifting again they thought it would be a good idea (so did I) to start manjing during the drag session. This was fine until one driver went just a bit too far and crossed the line disqualifying him for the rest of the day. 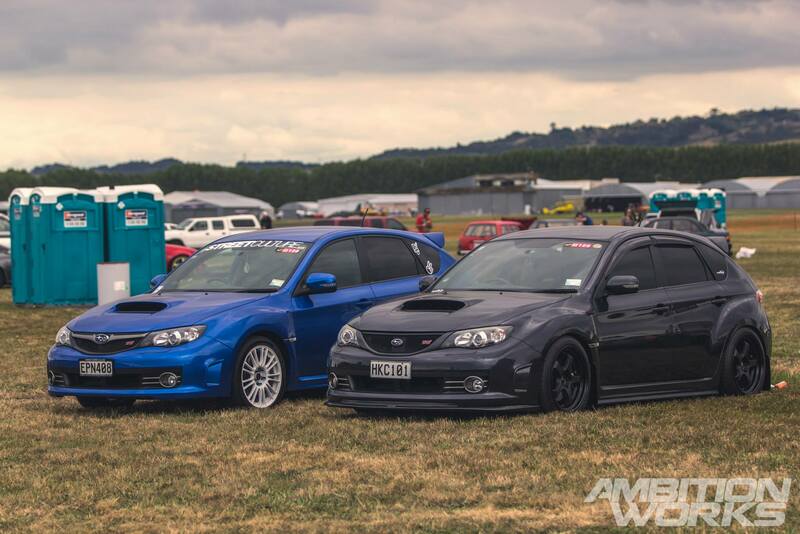 The action had finally finished at the air strip so I slowly made my way back to the pits when I was stopped by these two Subarus. Now, I don’t know much about Subarus but I know that this is one of my favourite new body shaped Subarus. But… What colour to choose? 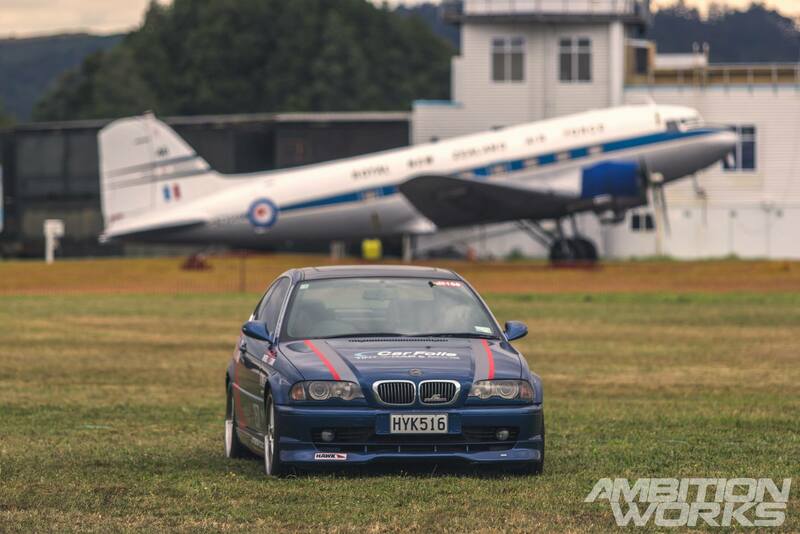 There isn’t much difference between a man and his car and a man and his plane. Each spend countless hours on them and in them, they know them inside out and wouldn’t trade them for any other hobby. After a long day at the track the last thing you want to do is put your road wheels back on and drive home, especially when the car was sitting this low on the grass. I’ve met a fair few people during the three or so years of automotive photography, and I have to say an event is only as good as the people you are there with. These people are friends, they are also family.